Patrick Weaver FAICD, was the Managing Director of Micro Planning International Pty Ltd (MPI) from its founding in 1987 until its original group of shareholders transferred ownership to a new owner/manager in 1999. During the 13 years of his leadership, Weaver and the other key PMI director Raf Dua, grew MPI from a start-up business to a respected project management organisation. MPI had an established client base for its range of project management software (Micro Planner X-Pert and Manager) as well as employing around 15 consultants, contractors and staff in various scheduling, sales, support and management roles in a wide range of client organisations. Under Weaver's direction, MPI's combined turnover from consulting, software sales and support grew to exceed $1million per annum. The Micro Planning International Pty Ltd group of companies has been producing award winning Microplanner project management software since 1979. MPI was founded in Australia in 1987 as a specialist 'Project Controls' company focused on applying the practical experience gained working with clients around the world using the Micro Planner range of software. $ Billions of projects were delivered "On Time and On Budget" using its software and services. For an update on the current state-of-the-art scheduling software, standards and training visit Mosaic's planning and scheduling page. The central business in the international 'Micro Planner' group is the current Australasian business, still managed by Raf Dua, is Micro Planning International Asia Pacific Pty Ltd. The Development of Micro Planner and the MPI Group of Companies to 1998. Micro Planning Services (MPS) starts trading in the UK. MPS was founded by Glynn Nixon, Steve Wedlock and others who adapted the ideas found in ICL's 1900 PERT package (to which Raf Dua was a major contributor within ICL) to the Micro Computer. Micro Planner is developed for the most innovative computer at the time, the Apple II. After 14 months development, the first project management package for a micro computer - Micro Planner for the Apple II - is available. Micro Planner is Accepted by Apple Computer as an official software product, and an agreement is signed with them for distribution throughout Europe. International Computers Limited (ICL), reputedly the UK and European Leaders in project management software, licence the rights to port Micro Planner onto their micro, mini and mainframe computers. International contractors, Taylor Woordrow, purchase their first copy of Micro Planner. The Planner for 256K IBM PC and Sirius/Victor are released. A new versions of Micro Planner for the Apple III is released. The company changes its name to Micro Planning Software . Apple Computer approaches MPS to become one of only six seeded UK developers to produce a package for their new and revolutionary Macintosh computer. Gateway Systems, a Californian Corporation with extensive project management experience, starts to distribute Micro Planner into the US marketplace. Micro Planner is developed for the Apple Macintosh. Following the demise of Gateway Systems Micro Planning Software USA formed, based in California. Micro Planner for the Macintosh is launched. Using the new mouse-driven graphical user interface, this product establishes Micro Planning as one of the world's leading software developers. Micro Planner ranked 4th in the Top Twenty Apple software charts. Project Training Ltd. is set up as an independent company to provide training courses in project management techniques and the use of Micro Planner in the UK. Computer Planning Services (CPS), managed by P. Weaver, starts using Micro Planner for consultancy and training in Australia. Micro Planner Plus released for the Apple Macintosh. A vastly enhanced version of the software designed to keep in line with Apple's hardware development, in particular the Macintosh Plus. Micro Planner V4 released for IBM AT PC's. Micro Planning Australia Pty Ltd starts trading. Patrick Weaver and Raf Dua are the Australian Directors. Micro Planning Software Ltd (UK) and Micro Planning Software USA merge to form Micro Planning International and turn their attention to the worldwide market. MPI starts association with RAAF developing the ASPS aircraft maintenance scheduling system at RAAF Amberley. Micro Planner Version 6 is released identically on Apple and IBM equipment (with Microsoft Windows) - the first cross-platform project management solution for companies with a mixed hardware environment. Continuing our tradition of 'first with the best', Micro Planner X-Pert is launched for the Apple Macintosh. X-Pert is a full-function package to rival the best available on any platform, including mini and mainframe software. Micro Planning International take over the InstaPlan Corporation (USA), adding the top selling, outline based package InstaPlan to an already impressive range of products. Micro Planning Australia changes its name to Micro Planning International Pty Ltd (MPI) to align with the rest of the MPI group. Micro Planner X-Pert becomes a yardstick for modern project management software tools - as one reviewer commented, 'X-Pert deserves to become the standard project management tool against which others are judged'. Micro Planner Professional, an MS-DOS product similar in capacity and design to X-Pert is released for IBM AT & 386 PC's. It is aimed at large corporates with an MS-DOS strategy, or for whom Macintosh technology is not an option. Micro Planner X-Pert 2 released for the Apple Macintosh. X-Pert continues to be heralded as 'the Rolls Royce of project management software'. Micro Planner Manager, a low priced cut-down version of X-Pert, is launched. In response to client demand, Micro Planning establishes its own training centres to provide courses on project management and the Micro Planner range of software. Services offered are expanded to include a wide variety of consultancy - from implementing a system from scratch to providing additional personnel for specific projects. InstaPlan EMS v4.1 released for IBM PC's. X-Pert wins its first MacWorld award for resource and project management. Micro Planner X-Pert wins its second MacWorld award for the best Resource and Project Management software, with Micro Planner Manager in second place. Micro Planner X-Pert for Sun released. 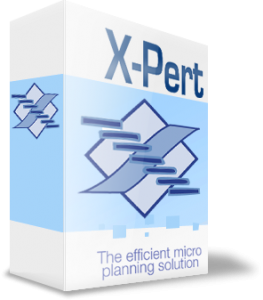 Micro Planner X-Pert running under Microsoft Windows is launched to provide an easy to use, high end package that offers the same functionality and value as the Macintosh version. X-Pert for Mac wins MacWorld award for resource and project management for the third year running. Micro Planner X-Pert wins MacWorld's 'Best All-Time' Readers Choice award to celebrate the Apple Macintosh Computers 10th Birthday. Micro Planner Manager running under Microsoft Windows is launched completing the three tiered product range for both PC and Macintosh platforms. X-Pert for Mac wins MacWorld award for resource and project management for the fourth year running. X-Pert for HP7000 and Silicone Graphics (Unix) workstations released. MPI supports Fallon Project Management Pty Ltd in the development of the VIPER aircraft maintenance management system - see more on VIPER. MPI opens linked web sites in the UK, USA and Australia. Macintosh sampler sets available for downloading from the UK site. MPI in the USA move offices from San Fransisco to Denver. Australia opens a new national office and both upgrade support services. Brian Doyle joins Micro Planner as Queensland manager. Fully 'Year 2000' compliant versions of X-Pert and Manager released. MPI and Fallon Project Management Pty Ltd collaborate to win the RAAF FleetOPS contract. The Australian MPI business is transitioned to new owners.